Born: 6 March 1858, Herefordshire, United Kingdom. Died: 24 October 1910, Johannesburg, South Africa. 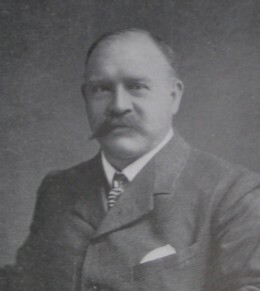 Thomas J. Britten, a British mining engineer, came to Johannesburg from England in 1887 as representative of and consulting engineer for R. Hornsby and Sons of Grantham, England. That same year he became a foundation member of the Rand Club. He erected many reduction plants on the Witwatersrand, among others at the mines Croesus, Paarl Central, City and Suburban, Royal, Moss Rose, Livingstone, Main Reef, National, Nabob, and Roodepoort Central. In September 1889 he resigned his position with Hornsby and started practising as a consulting engineer for various companies until July 1893, when he was appointed general manager of the Wolhuter Gold Mines. He resigned this position in 1903 and was appointed consulting engineer to Abe Bailey & Co., where he remained until at least 1908. Britten's patent atomiser was awarded the first prize of 500 pounds and a gold medal in the Transvaal Chamber of Mines competition, open to the world, for the prevention of miners' phthisis. This apparatus for settling the dust created in boring or blasting operations in mining was patented in the United States in 1904. In 1892 Britten became a foundation member of the South African Association of Engineers and Architects (from 1897 the South African Association of Engineers) and served on its council from 1897 to 1899. He joined the Chemical and Metallurgical Society of South Africa in or just before 1899 and was still a member of the renamed Chemical, Metallurgical and Mining Society of South Africa in 1903. He was one of the founders of the Mine Managers' Association in Johannesburg, and a member of council since its inception. He was also a member of the Chamber of Mines Patent Committee and of the (British) Institute of Mechanical Engineers, an associate member of the (British) Institution of Civil Engineers, and a life member of the American Institute of Mining Engineers. When he died in 1910 he was survived by his wife, Cecilia J. Botha, and two children. De Villiers, R. & Brooke-Norris, S. The story of the Rand Club (p. 175). Johannesburg: Rand Club,1976. National Archives Repository, Pretoria (TAB). Source MHG, Reference 16674. Estate documents, Thomas Johnson Britten. South African Association of Engineers and Architects. Proceedings, 1897-1898, Vol. 4, lists of members and office bearers.